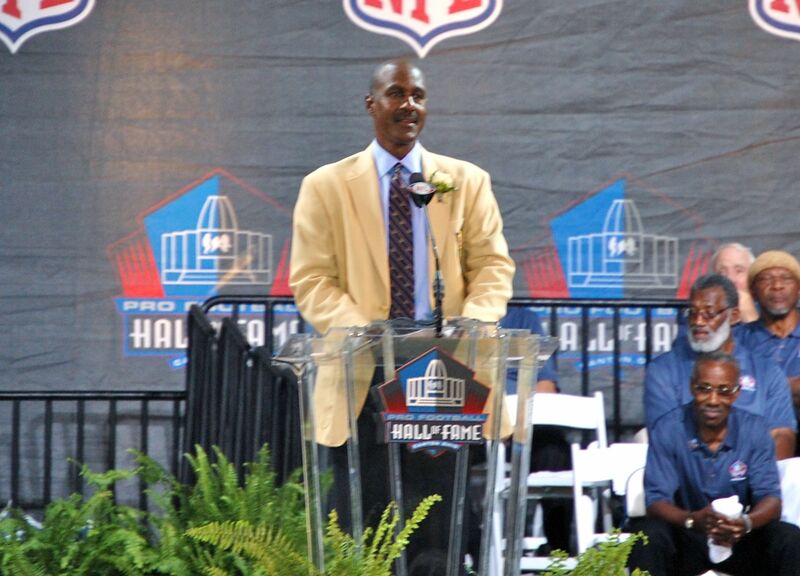 Art Monk received the longest standing ovation in the history of the Pro Football Hall of Fame when he was inducted in 2008. Photo by Mike Frandsen. The Washington Redskins have one of the greatest histories of any NFL team. Picking the Redskins’ ten best players is nearly impossible, so here’s a list of the ten best Redskins of the Super Bowl era, based on one observer’s opinion. Receiver Art Monk tops the list, Sonny Jurgensen comes in second, and John Riggins rounds out the top three. Sammy Baugh was the greatest Redskin, but this list only includes players who played since 1966. Sam Huff and Bobby Mitchell didn’t make the list, only because by the time the Super Bowl era had begun, their Hall of Fame careers were almost over. Only two defensive players made the list, though Dave Butz, Pat Fischer, Chris Hanburger, Dexter Manley, Charles Mann, and Wilber Marshall would have likely made the next ten. Special teamers Brian Mitchell and Mark Moseley also warrant consideration. Among Redskins from the past decade, Chris Cooley, Santana Moss, and Chris Samuels would probably make the top 30, but just barely. So without further ado, here are the ten greatest Redskins of the Super Bowl era. When Art Monk was inducted into the Pro Football Hall of Fame in 2008, he received the longest standing ovation ever at the Hall, lasting more than four minutes before he stopped the crowd. Monk played 14 of his 16 seasons for the Washington Redskins and led them to three Super Bowl victories and four appearances. His 106 catches in 1984 were an NFL record that stood for eight years. At one time, Monk also had the records for most catches in a career and most consecutive games with a catch. Monk was nicknamed “Money” for his uncanny ability to make crucial catches in big games. If there were a statistic kept for most critical first downs receiving, Monk would surely be at the top of the list. Monk had excellent hands, speed and height, ran precise routes, and was a fearsome blocker. He sacrificed his body to get the tough yards over the middle. Monk was one of the most respected players on a three-time Super Bowl winning team. In 1990, with the Redskins’ season on the line, the normally reserved Monk called a now legendary team meeting that lit a fire under the Skins. The Redskins went on to win four of their next five games to make the playoffs and won the Super Bowl against Buffalo the following year. Washington’s record was 6-5 before the meeting and 22-4 after. In the playoffs, Monk had four 100-yard games as well as seven touchdowns for an average of 26 yards per catch for those touchdowns. In Super Bowl XXII against Denver, with the Redskins down 10-0, Monk caught a critical pass after missing the previous two playoff games with an injury. Monk caught a 40-yard pass on a 3rd and 16 play. Without that catch, history might have been different, but the Redskins went on to win, 42-10. In January 1992, Monk had seven catches for 113 yards as the Redskins beat Buffalo 37-24 in Super Bowl XXVI. If coach Joe Gibbs gets credit for three Super Bowls with three quarterbacks, Monk should too. He didn’t play with a Hall of Fame quarterback, but he was a Hall of Fame receiver, and the best Redskin of the Super Bowl era. Sonny Jurgensen has been called the greatest pure passer in the history of the game. Longtime Redskins fans say Sonny would heave the ball long, get sacked behind a porous offensive line, and then dust himself off to learn that Charley Taylor, Bobby Mitchell, or Jerry Smith had come down with the ball. The 1964 trade that brought Jurgensen to the Redskins from Philadelphia for Norm Snead was one of the most lopsided deals in NFL history. Jurgy passed for more than 3,000 yards three times as a Redskin, in an era that did not favor aerial attacks and led the NFL in passing three times. Jurgensen set NFL records for yards, attempts, and completions in 1967. By the time the Redskins became a playoff team in the 1970s, George Allen had given the job to the more conservative Billy Kilmer. But in his prime, Sonny was one of the game’s great signal callers. Today, Sonny is still one of the most recognizable Redskins, three decades after first calling games on the radio. Riggins, a former track star at Kansas, possessed a rare combination of power and speed on the way to rushing for 11,352 yards and scoring 116 touchdowns. Riggo played like a runaway truck, and his nickname of the “Diesel” was never more fitting than during his famous run through the playoffs in January 1983. Riggins’ iconic bow to the RFK Stadium crowd after rumbling for 185 yards in a playoff win over Minnesota is etched in the minds of Redskins fans everywhere. Redskins fans will always remember “70 chip,” the 4th and 1 play In the Super Bowl against Miami, when Riggins ran for a 43-yard touchdown to seal a 27-17 victory. Riggins finished with 166 yards rushing and took home the MVP trophy. Riggins was one of a kind, once telling former Supreme Court Justice Sandra Day O’Connor to “loosen up, Sandy baby.” After Riggins sat out the 1980 season in a contract dispute, Washington’s new coach, Joe Gibbs, traveled to Kansas to convince Riggins to return. “I’m bored, I’m broke, and I’m back,” said the running back upon returning to the nation’s capital. The rest is history. This entry was posted on July 26, 2011 at 9:57 pm and is filed under Uncategorized. You can follow any responses to this entry through the RSS 2.0 feed. Both comments and pings are currently closed.